Welcome To K-LEE RADIO - You've landed on the website that plays the Very Best in Cape Breton and Celtic Music and has been broadcasting on the internet since 2009. In that time we have introduced many new musical singers, songwriters and instrumentalists to Cape Bretoners and our friends around the world. Our goal is to promote Cape Breton Island through its music, culture and physical beauty and to help develop community spirit with our News, Music and On Location radio broadcasts.We truly see ourselves as "The Voice Of Cape Breton". 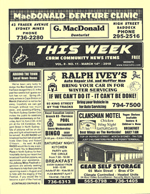 Our Community News publication "THIS WEEK IN CBRM" is published every Wednesday in printed form and online here as a Digital Download. Read the latest from around the Northside area - click on the copy of the paper at left to see the latest edition. 3 - Tall Tales & Udder Lies, 25 stories of Cape Breton characters 4 - The Cape Breton Joke Book - 5 - Cape Breton Recipes, 64 pages of local food favorites 6 - A Cape Breton Christmas, stories telling of many Christmas adventures around Cape Breton Island.